Set Forms. The Well-Ordering Theorem. The Axiom of Choice. The Law of the Trichotomy. Maximal Principles. Forms Equivalent to the Axiom of Choice Under the Axioms of Extensionality and Foundation. Algebraic Forms. Cardinal Number Forms. Forms from Topology, Analysis and Logic. Class Forms. The Well-Ordering Theorem. The Axiom of Choice. Maximal Principles. List of the Set Forms. List of the Class Forms. 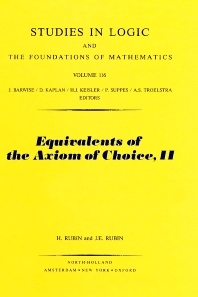 List of Forms Related to the Axiom of Choice. Bibliography. Index.